One of today's most popular patterns for knitting on the needles is "pigtails". It gives the painting a tactile and stylish look. Following our tips you will be able to understand the secret of crochet braids on the spokes. For a first experience best fit the thick smooth strands. Take two needles and thread and the dial 14 of the loops. The first loop in a row is always thrown on the needle, not promazyvaya, and the last in the series – always promazyvaya front loop, these loops do not participate in the formation of the pattern. Take the needle with loops in left hand and empty needle in your right, and start knitting the first row. Provarite 4 reverse loop. When knitting purl loops thread should be between you and the knitting. Pass free knitting needle into the loop from behind, hook the thread and utahnite a new loop on the wrong side of the work. Knit St on left needle throw. After you knit 4 purl loops, proverite 4 facial. To do this, the thread loop over the knitting needle, pass right needle into the loop movement "from itself", hook thread and utahnite a new loop on the front side of the work. Knit St on left needle again throw off. After 4 facial loops provarite again 4 purl loops. The first row is finished. Expand work and provarite the second row. The first 4 loops provarite facial loops, 4 loop – back, the last loop – back face. Third row provarite as well as the first and the fourth as the second. Take a cloth, get one of the convex stripe down the middle. Divide this strip into two pieces and twist them together. For this provarite the first 4 loops are reverse loops. Crucial moment: swap the 5 and 6 loops 7 and 8 loop. To do this, remove 5 and 6 loops, then leave them for canvas transfer, not promazyvaya 7 and 8 of the loop on the left needle. Put 5 and 6 loops on right needle, return back 7 and 8 loop. Now on the left needle loops are reversed. Provarite them, as usual, front hinge, finish row 4 purl loops. If the strips wider than 3 loops, use an extra needle. Tie the sixth series as well as the second (4 front, 4 reverse, 4 front). Then provarite the seventh row (as the first), the eighth (as the second). Repeat pattern from 5th to 8th row, multiple times if necessary. So you learned how to knit braids on the spokes. 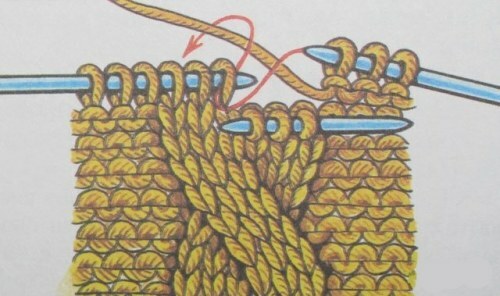 How to knit Braid pattern knitting diagram knitting pattern. Braid Pattern No. 1. This pattern with the third additional spokes get the slope of the loops left and right. To perform “braid” on the spokes dial number of stitches divisible by 11 plus 2 stitches for the symmetry of the pattern, plus 2 edge loops.